Whether you’ve recently joined the leagues of owning some Ripple, or have been a long-term XRP holder, there’s still one thing left for you to do – decide on the best way to safely store it. Just read the best ripple wallet guide out there and decide for yourself. With a market cap of over USD$18 billion, Ripple (XRP) currently sits on the cryptocurrency charts as the cryptocurrency with the third largest market cap. Given that the cryptocurrency has continued to flourish both in terms of price and popularity, XRP is considered by many to be a staple cryptocurrency to have in one’s cryptocurrency portfolio. We imagine that some of you are now thinking, “Can’t I just keep my XRP on a cryptocurrency exchange?” Although we hate to the bearer of bad news, there’s no skirting around the fact that cryptocurrency exchanges are not designed to act as storage wallet for your XRP (or any other cryptocurrency for that matter). Cryptocurrency exchanges provide many services – but cryptocurrency storage is definitely not one of them. There have been far too many instances of exchanges being hacked to name them all, but two recent cases include the June 2018 hack of multiple altcoins on Korean exchange Coinrail, and the January 2018 hack of Japanese exchange Coincheck, where hackers took off with nearly $500 million worth of cryptocurrency holdings. So, where should you be storing your XRP? Below, we’ve rounded up some of the most well-known ripple wallets – from cold storage solutions like hardware wallets and paper wallets, to hot storage solutions like desktop and mobile wallets. Just keep reading, and you’ll learn everything you need to know to help ensure your Ripple is stored safely and securely. If you’ve already been in the crypto world for a while, you may have noticed the word “cold storage” floating around. What is “cold storage” exactly? This term refers to cryptocurrency storage solutions that store your cryptocurrency private keys in an offline environment. Cold wallets, therefore, are a term that describes any cryptocurrency wallets that keep your private keys offline. Yes – that means that if someone other than you were to come into possession of your private keys, they would have the means to access your cryptocurrency holdings. That is precisely the reason it’s crucial that you take proper measures to ensure that your private keys are kept, well, private. This forms the crux of why cold storage wallets are the ideal choice for anyone who wants to keep their cryptocurrency portfolio secure. Exposing your private keys to an online environment opens the doors up to all of the countless vulnerabilities that fester online, such as malware and hackings, to name a few. Conversely, if your private keys are kept offline, your private keys are shielded from any possible online vulnerabilities. You may be asking, what’s the difference between a Ripple wallet and an XRP wallet? Nothing – but it’s complicated. Officially, Ripple is a different entity from its cryptocurrency, XRP. However, laymen and most people use the two interchangeably. (Much to Ripple’s chagrin). We recommend that you use a wallet that is offline. Yet, this list can be tricky. What kind of wallet fits your needs the best? A hardware wallet is a physical device that stores your private keys offline. Hardware wallets are reputed to be the safest means of storing your cryptocurrency holdings, including your Ripple stash. Think of a hardware wallet to be like a personal storage vault that is not only fully portable, but is also equipped with the security to safely manage your own holdings. 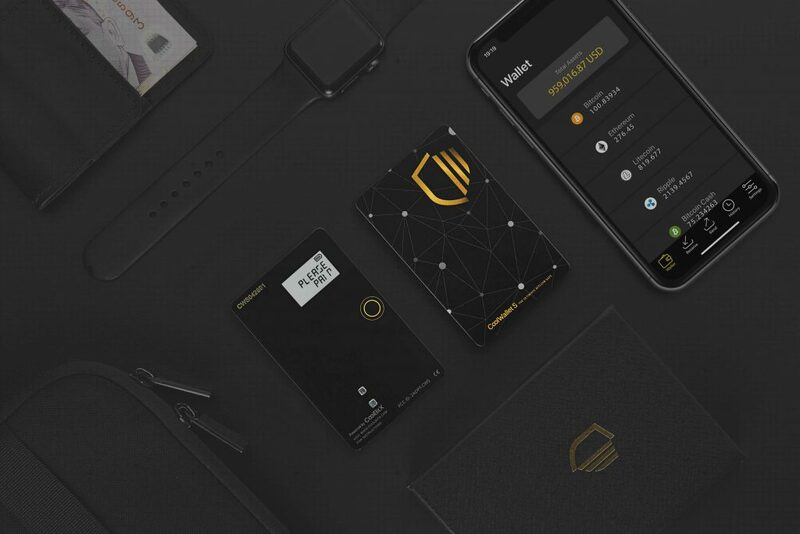 If you’re after a hardware wallet that provides security, convenience, and a sleek design all in one, the CoolWallet S is it. As you can see from the image above, the CoolWallet S has the look and feel of a credit card. Known for it’s world-class size and amazing functions, it’s the XRP wallet for anyone who wants to access their cryptocurrency portfolio on-the-go, or prefers to carry their wallet on their person. The security system integrated in the CoolWallet S is also outstanding compared to many other hardware wallets. Its security system combines the world’s largest verified address database of the MetaCertProtocol with its own patented hardware, and is designed in such a way that a single component of the system is incapable of controlling the other components. This means that if a hacker set out to compromise your device, they would not only need control of your CoolWallet S, but also the CoolWallet S app and the original user (who is, of course, you). Another example of one of the CoolWallet S’ unique attributes is that unlike many other hardware wallet solutions, it allows you to access your stored currencies securely on your IOS device (including your iPhone and iPad), as well as any Android device. And for those wondering about trading crypto on the CoolWallet S, we recently announced a new partnership with JOYSO – one which will provide users with the opportunity to make direct peer-to-peer trades using their CoolWallet device. It is, in fact, the first time ever a hardware wallet will offer such capabilities. Let us explain a bit further: while in the past, all hardware wallet trades required a desktop computer and multiple party integration to manage and send funds. Now, users can make these trades simply on their mobile device using the native wallet-exchange integration offered by CoolBitX and JOYSO. Trezor is one of the most popular hardware wallets on the market, which similarly to the CoolWallet S, offers multi coin support. In addition to Ripple, Trezor supports storage for more than 500 different cryptocurrencies. Trezor offers a number of security measures including firmware verification, an ultrasound hardware seal, protected key operations, secure update procedure, additional passphrase support, write-protected bootloader, and backup and recovery processes. The company is very transparent about past security incidents with its devices – they even have a dedicated page to which lists any security incidents that have occurred. For example, in April 2017, there was an incident involving SRAM memory access. In the words of Trezor: “the SRAM was not cleared on soft reset, allowing extraction using special firmware and direct access to the device board.” More recently in February 2018, there was a STM32F205 chip issue which meant that the Trezor One’s bootloader memory write-protection was not working as intended. So, how does Trezor compare to the CoolWallet S in terms of portability and durability? The Trezor is no doubt small and lightweight, however, in order for it to be functional, you need to connect it to your computer via a USB plug. Conversely, the CoolWallet S is free of any cords, and connects to your account via Bluetooth technology. As aforementioned, the CoolWallet S is also optimized for maximum mobility with its “credit card design”, and its waterproof, tamper-proof, impact resistant, heat and cold resistant properties mean you don’t need to worry about being “precious” with it. One similarity the CoolWallet S, the Trezor, and other hardware wallets share is their price. There’s no beating around the bush that hardware wallets are the most costly of all XRP wallets. Ranging usually around a couple of hundred dollars, many cryptocurrency holders question whether hardware wallets are really worth forking out money for. The decision, of course, is ultimately up to you to make. But if you’re serious about keeping your XRP and other cryptocurrencies safe, you should consider taking advantage of the high-level of security, functionality, and ease-of-use hardware wallets provide. Paper and steel wallets are another cold storage option available to XRP holders. Compared to the high-tech features hardware wallets provide, paper and steel wallets represent a more stripped back and manual means of keeping your Ripple safe. A paper wallet is simply a piece of paper that you have printed your private keys or QR code onto. Similarly, a steel wallet is a metallic object that have your private keys etched into. So why do people choose to go down the paper and steel wallet route? A big drawcard is the price – or lack thereof. Paper wallets are virtually free, as the only cost required is the price of a piece of paper and ink, while steel wallets only require the cost of a small piece of steel and an engraving tool. Furthermore, both eliminate the need for an intermediary service to help maintain your XRP holdings. Your holdings are figuratively – and literally – in your own hands. Unfortunately, there are some downsides to paper and steel wallets. Although you do get to have complete control of your holdings, that means the responsibility for the maintenance of your holdings is solely on you. While they may seem relatively easy in terms of upkeep, both paper and steel are subject to the elements and therefore so are your private keys. Furthermore, if you lose your paper or steel wallet, or someone steals it, whoever obtains it will have your private keys, and consequently, access to your cryptocurrency holdings. On the other end of the wallet spectrum are hot storage solutions for safeguarding your Ripple. While cold storage ensures that your reserve of cryptocurrencies are kept in an offline environment, hot storage solutions keep your reserve of cryptos online and connected to the net. As discussed above, that means that any and all hot storage XRP wallets run the risk of the perils of the internet – hacking, malware, and phishing. That’s not to say hot storage solutions should be avoided altogether. Hot storage solutions can be handy if you’re only safeguarding small amounts of crypto, or if you want to perform quick trades or liquidations. But to err on the side of caution, it’s highly recommended by everyone from cybersecurity experts to respected cryptocurrency traders for cryptocurrency traders to keep the majority (or ideally, all) of their holdings in cold storage. Think about it – even if you think your holdings are at present somewhat “insubstantial” – the value of your holdings could one day grow quite substantially, or even skyrocket (or in crypto lingo, “go to the moon”). In such a case, would you really want to be scrambling to secure your tokens? More than this, there really is no way to predict when the next big hack, virus, or malware will strike, or when a system bug may render your hot storage solution vulnerable to attack. If a hot storage XRP solution still interests you, here’s a look some of the most well-known XRP hot wallets. Toast Wallet is considered very easy to set up and use. As far as we can see, there are no substantial complaints that have been made about Toast Wallet by users. A downside, however, is that it only supports storage for your XRP – meaning that you’ll have to find another storage solution for your other cryptocurrencies. If you’d like to learn more about how to use Toast Wallet, check out their FAQ page here. Another desktop storage option for your XRP is Cryptonator. According to Cryptonator’s homepage, the company has 1 million active accounts and 40 million processed transactions. A major drawcard of Cryptonator is that it offers a personal account in which you can make cryptocurrency transactions using their in-house exchange, as well as store your digital assets. Another attractive feature is that Cryptonator enables tracking of the fiat value (e.g. USD, EUR, GRP, RUR, AUD, and other currencies) of the cryptocurrencies in your portfolio. Cryptonator promises to keep your assets secure, highlighting that they run all of their services over secure SSL (HTTPS) connection, and that they hash critical user data by SHA-256 cryptographic algorithm. Moreover, two factor authentication for logging in is provided complete with one time passwords. A word of warning though, if you take a look at reviews of Cryptonator, they are overall quite negative. For example on CryptoCompare, Cryptonator only has a 2.3 out of 5 rating. On the site, there are numerous complaints about the usability of the wallet, not being about to withdraw tokens, and the company’s poor customer support. There are even claims about various cryptocurrencies not showing up in the wallet. So while not all users have had a bad experience, at least according to reviews – many have. As such, we strongly advise those wanting to try it to err on the side of caution, and start off by using only small amounts of cryptocurrency on Cryptonator. Remember – it’s still always safest to keep the majority (if not all) of your cryptocurrency holdings in cold storage. [tip_coolwallet_style image=”https://coolwallet.io/wp-content/uploads/2018/04/bigtip.png”]You may have come across some reviews of the full desktop client, “Rippex Wallet,” in your research of XRP wallet solutions. However, earlier this year, Rippex announced that it is “permanently disconnected,” so it is no longer a wallet option. Mobility and cryptocurrency is the next big thing. Coming out of the dark ages of only using bitcoin on a desktop, cryptocurrency will continue to thrive on mobiles with its massive user base, ease of use, and creative use cases. Here are few mobile wallets that we recommend. Even though the CoolWallet S falls into the hardware wallet category, it is also a mobile wallet. The use cases here for a hardware wallet are quite clear. Protecting your assets on the go will make you forever sleep (or walk) freely knowing you’re safe from hacks. This being said, the makers of the CoolWallet S, are not content with the wallet simply being a storage wallet. A wallet can also be a secure account in which you can use your money in any way you like, such as trading, spending, sending, receiving airdrops, social media tokenization and more. Apart from its deep security offerings, the CoolWallet S uses ShapeShift to swap your XRP into all major altcoins (and, of course, back again right?). Indeed, Edge prioritizes functionality by streamlining a number of functions on their app. For starters, you can backup your account with just your name and password. Logging in is also easy, with either a PIN or Touch ID, and you can do so with multiple devices. One of most convenient features of Edge is that it integrates with ShapeShift, allowing you to to easily swap between different cryptocurrencies on your account. For example, using ShapeShift, you can swap your Ripple for Bitcoin, and your Bitcoin for Ripple. While all of this may have you jumping to sign up – you should keep in mind that mobile cryptocurrencies wallets are considered one of the least safest places to store your Ripple and other coins. Using a mobile wallet to make payments or transfers with your cryptocurrency is one thing – however, using it as your primary means of securing your assets is another. Mobile wallets, after all, are hot wallets – which as you may recall means that they are always online. Consider also that Touch ID in itself is a huge and growing security problem. As explored in the article, “Your phone’s biggest vulnerability is your fingerprint”, it is incredibly easy for hackers to gain access to your phone via fingerprint touch ID. Although it sounds like the plot of a sci fi movie, technology has advanced so far that a fingerprint can be successfully molded or even printed using a 3D printer, and used to unlock a device using touch ID. And while security for mobile wallets is arguably improving, they are still a major – and relatively easy – target for unscrupulous hackers. Moreover, just think about how many times you’ve accidentally misplaced or lost your mobile phone. It’s all too easy to do – and the unfortunate reality is that if your private keys are on your mobile phone and you lose or misplace it, or if your mobile is compromised, your crypto assets are as good as gone. As you have discovered, there are a wide range of Ripple storage wallets on the market – each varying in the level of functionality, design, cost, and security they offer. By reading this article, and doing your own research, you’ve already put yourself on the right track to securing your Ripple. The next move is to narrow down which Ripple wallet offers the ideal balance of features and functions. You should choose a wallet solution that not only provides safeguards to protect your Ripple, but also offers you the means to easily and safely access your XRP when you choose to. It’s an important decision, and one which our advice above should guide you with. Best of luck, Ripple HODLR!